PM is against people who push other people around. PM belongs to no political party. PM is absolutely free and uncensored. PM's sole source of income is its readers -- to whom it alone is responsible. PM is one newspaper that can and dares to tell the truth. PM's bold mission attracted some of the best photojournalists, writers, and artists, including the left-leaning journalist I.F. Stone, novelists Ernest Hemingway and Erskine Caldwell, future Speaker of the House Tip O'Neill, photographers Margaret Bourke-White and Arthur Fellig (better known as "Weegee"), cartoonist Carl Rose, and Dr. Seuss. Old Star Spangled Fanny . . ."
And on it he sitz and he sitz. The poetry may not sparkle like that of his children's books, but its cadences are certainly Seussian and its message is unmistakably anti-Isolationist. 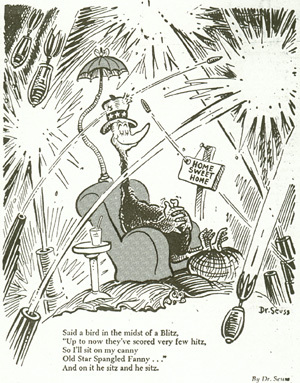 At left: a Dr. Seuss cartoon from PM, 23 June 1941. Crockett Johnson, another artist who would later become famous for his children's books, had been looking for a newspaper to publish "Barnaby." After he showed the strip to Hannah Baker (PM's comics editor), the upstart daily took a chance: "Barnaby" made its debut in April 1942, and quickly became one of the paper's most popular features. Above: "Barnaby" in PM, 30 July 1945. By September 1944, the strip was in 31 U.S. Newspapers, including the Baltimore Evening Sun, the Philadelphia Record, the Chicago Sun, and the St. Louis Star-Times. At the height of its popularity, "Barnaby" was syndicated in 52 American newspapers (with a combined circulation of nearly 5,600,000). Irrespective of phenomenal successes like "Barnaby," first-rate investigative journalism, and innovative design, PM consistently lost money. After eight years of underwriting the unprofitable paper, Marshall Field III sold PM to Bartley Crum on May 1, 1948. The last issue of PM appeared on June 22, 1948. On June 23, it was replaced by the New York Star, which ceased publication on January 28, 1949. In May, Ted Thackeray began publishing the Daily Compass on PM's presses; though generally consistent with PM's politics, the Daily Compass folded in 1953. "Cushlamochree!" Newsweek 4 Oct. 1942: 102, 104. Hoopes, Roy. Ralph Ingersoll: A Biography. New York: Atheneum, 1985. All about the man who founded PM, but not the first book to consult (start with Milkman's history of the paper). Margolick, David. "PM's Impossible Dream." Vanity Fair January 1999: 116-132. A concise, well-written history of PM, including a number of great photographs. Recommended. Milkman, Paul. PM: A New Deal in Journalism, 1940-1948. New Brunswick, NJ: Rutgers University Press, 1997. The definitive history of the newspaper: highly recommended. Read a book review by John L. Hess in the Nation, 14 July 1997. "O'Malley for Dewey." Time 18 Sept. 1944: 50. For more on Dr. Seuss and PM, see my bibliography on the subject: <http://www.ksu.edu/english/nelp/childlit/seuss/resources.html>.